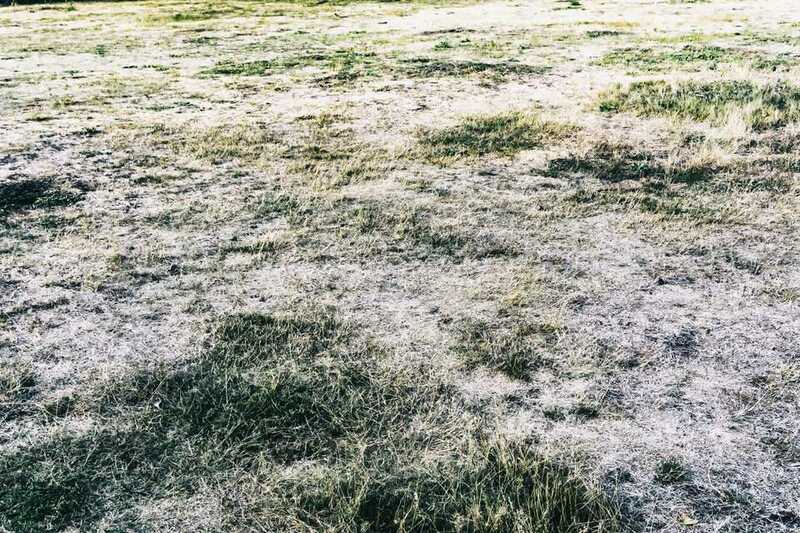 Drought conditions are becoming the new normal in many parts of the country but that doesn't necessarily mean we have to throw our hands up in defeat and surrender the lawn to the harsh conditions. There are lawn care techniques for lawn care during drought conditions and technology is constantly improving grass cultivars allowing for improved, drought tolerant types of lawn grasses. There's no one solution to dealing with drought, but rather a multi-pronged defense that can help bring your lawn through the worst periods of an extended dry spell. Beyond "training" a lawn to survive with less water, there are management techniques you can use to help the lawn during times of drought. Not surprisingly, staying off the lawn is the biggest help. Drought conditions are extremely stressful to a lawn so avoiding further stress is key. Hold off on projects like aerating and detaching and keep the height of cut as high as possible so the plant retains all the moisture that it can. It all starts with the basics. Most lawns are over-watered, to begin with so learning how to properly water a lawn will go a long way towards supporting it during times of drought or water restrictions. An often overlooked fact is that people are responsible for the water use on lawns, not the lawns themselves. Even water-loving grass species like Kentucky bluegrass are capable of surviving and thriving with much less water than they are normally accustomed to. Often it is not an extended drought but regular summer heat that can stress a lawn out to the point of decline. Again, managing for the stresses will prepare the lawn for drier conditions and better allow it to pull through the tough times. Keeping the height of cut as high as possible and encouraging deep rooting are the most important aspects of dealing with summer heat. It is also crucial to avoid further stresses like aerating and detaching to avoid further decline or inviting other destructive elements like insects or disease. Some grasses are drought tolerant by nature, thriving in conditions most grasses could never handle. These drought-tolerant traits can also be isolated and retained during breeding, resulting in unique cultivars of grass which are attractive lawn grasses while being drought tolerant. Traditionally, drought tolerant grasses have not been typical lawn grasses but new cultivars, especially fescue species, are both drought resistant and adequate as a lawn. When drought strikes it is important to not put additional stresses on the lawn. Mowing the lawn too short and even too often during times of drought can have devastating consequences. At the worst, the dormant grass will become worn, injured and unable to recover once rain and cooler temperatures return. Keeping the lawn high will retain important photosynthetic leaf material and aid in moisture retention. One of the best ways to get your lawn through a drought is to practice great lawn care habits. A deep-rooted lawn of the appropriate grass species, when mowed regularly at heights of 3-4 inches grown and in soil with adequate organic matter, should withstand extended periods with little or no supplemental irrigation. Great lawn care habits are the key to weathering adverse conditions. Many areas of the country have experienced major droughts and water shortages resulting in bans, restrictions, and a cultural shift towards water conservation. In some cases where water is scarce and a large lawn is no longer practical, it makes sense to downsize. If a lawn is still desired for children or pets or even aesthetics there's no need to eliminate it completely, just make the area smaller and easier to manage. Artificial grass kind of flies in the face of everything I believe in, but still, I understand it and see it's usefulness in certain applications. Desert environments undergoing water restrictions hardly merit an argument for a lawn and a little patch of artificial turf can be all that is needed for a pet or sitting area. Maintenance is easy and many varieties of artificial turf get very close to looking like the real thing.